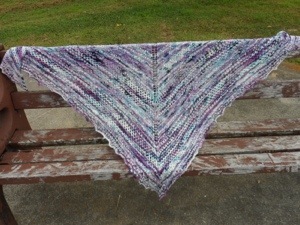 Last summer, I promised my cousin Judy, a knitted shawl. I fully intended to finish it quickly. But, before I could even start, I fell and badly broke my wrist. It’s taken quite a while to heal (a long story in itself) but I finally finished and will be mailing it to her on Monday! I’m also glad to be blogging again. See you soon….I promise!!! This entry was posted in knitting, shawl and tagged cousin, knit, lace, shawl. Bookmark the permalink. Hey! Check Out These Great Knitting Blogs! I’ll get a button here soon, I hope. Meantime, just look for me on Ravelry as CLPETTY! :). Here’s Your Chance to Say Something to Me! sockknitter1215 on It’s Fair Time! mrsknitandpurl on It’s Fair Time!